Asphalt Green’s Recess Enhancement Program (REP) has mastered how to have fun while being safe on the playground. Whether playing indoor or outdoor games, our coaches have rounded up their best tips to keep recess running smoothly. Prevent bullying by being a good role model. Modify games based on space limits. Alleviate conflict with Rock, Paper, Scissors. Map out your play space. When explaining a game, show instead of tell. One of the most important parts of leading a successful recess game is effectively explaining how to play. Demonstrate the rules of a game to avoid confusion. Show instead of tell. For example, if you are leading REP game of the month Pin Down, the only way to knock over a pin is by throwing a ball. The leader should demonstrate the way students should release the ball. You can even demonstrate the wrong way to play by knocking a pin down with your hand (just make sure the group understands this what you are NOT supposed to do). By displaying the behaviors you do and don’t want to see, you eliminate ambiguity. Prevent bullying by being a good role model. Bullying is a major concern in schools, particularly during recess. If you see bullying, say something. If a child is at risk, notify a school principal, guidance counselor, or teacher immediately. The best advice to deal with bullying is to be a good role model. Research shows adult role models and a positive school environment can reduce bullying over time. Check for understanding. Remembering the rules to games can be challenging for kids. As you explain the rules, be sure to check for understanding. For example, if you are playing a tag game that requires students to tag with two fingers, ask the group, “How many fingers do we tag with?” This question both reinforces the rule and gives you confidence that the students understand what is expected of them. Avoid asking yes or no questions and be specific. When you check for the understanding, the game is more likely to run smoothly. Modify games based on space limits. New York City public schools often struggle to find space for indoor recess, but all you need is a hallway to get students active. Take students' favorite outdoor games and modify the rules to make them indoor friendly. If your students love playing tag outside, for example, slow down the pace indoors by instructing students to hop or do their favorite dance move instead of running. In some cases, modifying the movements can make the games even more fun than the original! Put a stop to conflicts before they start. Conflicts are inevitable during recess. One way to settle disagreements is to make a game of Rock, Paper, Scissors the deciding factor. At the beginning of each recess period, make this rule clear. It’s quick, fair, and, most importantly, you can’t argue with the results of Rock, Paper, Scissors! Eliminate team captains. Being picked last for a team is not a good feeling. Keep recess fun for everyone by eliminating captains. Instead, it is the facilitator's role to create the teams. This way, the teams will be evenly balanced, and no one will feel left out. Make it more interesting by naming the teams after the pros (Team Mets vs. Team Yankees), superheroes (Batman vs. Superman), or even foods (PB&J vs. Pizza). Get creative and have fun with it! Follow the 80/20 rule. Explaining a game to a large group of students can be difficult. There will always be a few students who are not paying attention. Keep the 80/20 rule in mind. When leading a game, if 80 percent of students are active and engaged, consider it a success. The 20 percent remaining will learn how to play the game from their classmates as the game continues. When the majority of students are focused and having fun, everyone will want to join in! Map out your play space. Kids running into each other is one of the biggest causes of accidents on the playground. Reduce these incidents by clearly and consistently mapping out the play space. Each game should have its own piece of the playground, which will prevent students from running through other games. For example, tag games stay within certain boundaries, jump ropes are in another area, and basketball is exclusively on the designated court. Teach teamwork. Teamwork is important at recess and in all aspects of life! Create a positive climate on the playground. 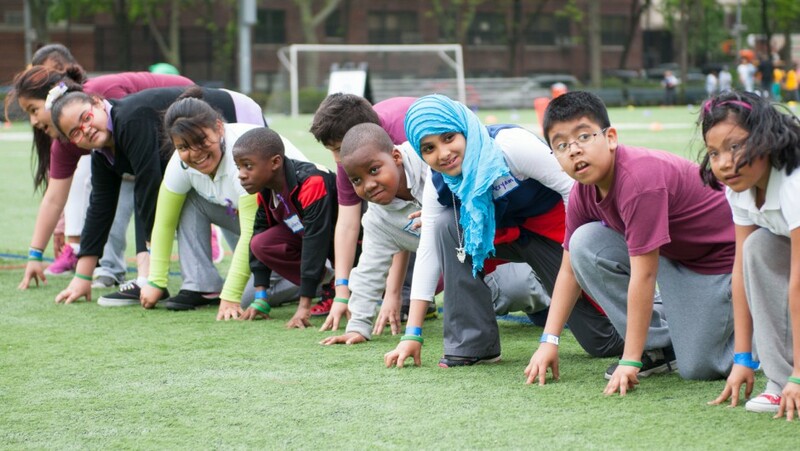 Through organized recess games, students learn to communicate, cooperate, and include others. Encourage students to cheer on their teammates during play and to high-five members of the other team when a game concludes. Children take the lessons they learn on the playground and apply them to the classroom too.